Smile for the camera, ladies! Syracuse, New York, circa 1905. "Clinton Square." 8x10 inch dry plate glass negative, Detroit Publishing Company. View full size. Submitted by perpster on Wed, 10/04/2017 - 10:36pm. The empty wagon proclaiming "Chas Hubbard Son & Co, esale, STS" belonged to Charles Hubbard, Wholesale Druggists, 211-213 North Water Street, Syracuse, NY. That address no longer exists, being now part of the James Hanley Federal Building in downtown Syracuse. Mr. Hubbard's rise to pharmaceutical prominence can be read about here. Submitted by maddog on Wed, 11/23/2011 - 6:56pm. The headboard and chairs appear to me to be carefully wrapped, perhaps in cotton batting and twine. The young roustabout near the grocery wagon is looking at the toppled grain sack as if it's a wonder of nature. I wonder if he got motivated enough to clean it up or pulled a "Bart Simpson"? The gent in the nice threads probably should make that much. He might be the barge captain, owner or both. Just in front of D. Moran's grocery wagon across the street is that a boy pushing a woman in a wheelchair? The lawn and flower beds are nicely tended. The garder (street cleaner?) and the young girls all have their attention drawn across the street. Was that horse startled? Some serious window cleaning on the second floor above O'Herin's. There is a woman in the first floor window. Taking a break or a "desperate houswife" of 1905? Mailbox, policeman and young boy with a basket on the corner. I wonder what the boy is doing? I know the policeman is on his way from the cigar store to the doughnut shop. Interesting wagon-mounted two man lift. Great picture but it takes an hour to view! Submitted by Michael R on Wed, 11/23/2011 - 4:57pm. 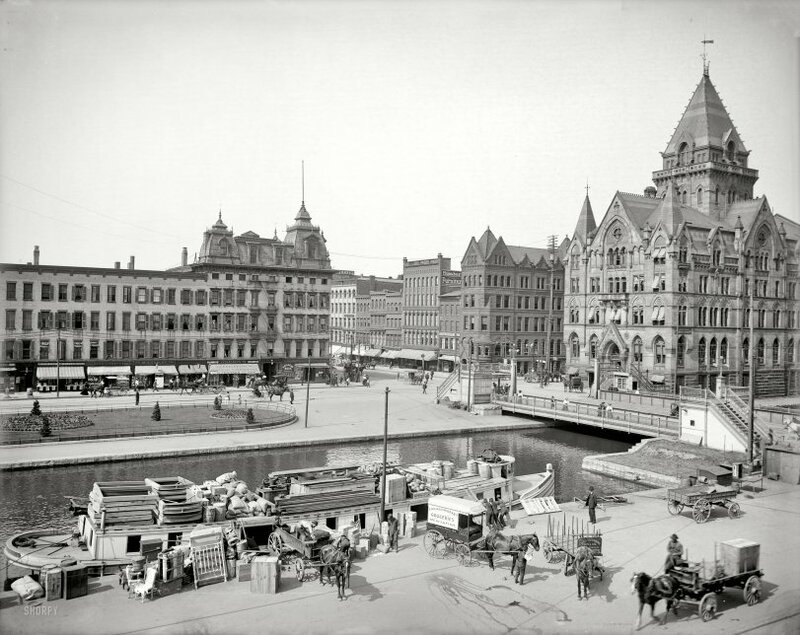 The big Victorian Gothic structure at the right is Joseph Lyman Silsbee's Syracuse Savings Bank Building of 1875-1876. Silsbee became proficient in several architectural styles in rapid succession; in 1886 he moved his office to Chicago where he designed many Shingle Style houses and became the first employer of a young man from Wisconsin named Frank Lloyd Wright. Submitted by Ice gang on Wed, 11/23/2011 - 10:12am. We can see where the Irish migrated to. Also great to see products moved by boat, what canal is that?? Submitted by nixiebunny on Wed, 11/23/2011 - 9:37am. There's a guy with a pipe watching the three guys roll the barrel up the ramp into the boat. I assume he earns as much per hour as all three laborers put together. Submitted by bigguy1960 on Wed, 11/23/2011 - 7:54am. Now there's something you don't see every day, or ANY day for that matter, a pedestrian lift bridge that is usable in both the lowered and raised positions! Clever!